Kids Video Play - collection of kids dedicated movie & fun learning videos. You and your kid(s) will love the video categories and easy to use interface. Video Categories to name few are : Rhymes, Movies, Short Stories, Science for kids, Fun Learning. * 100's of free kids movies (English & Hindi). * Large collection of Rhymes and Moral Short Stories (English & Hindi). * Videos are free of cost and child safe. * No need to register or create any account. * Easy and simple to use. * Dedicated sections for fun learning, science for kids and kinder garden learnings. * English and Hindi videos are into separate categories. * Regular updates on videos. * 'More' button to share the videos. * Timely Addition of new categories as per availability, however pretty regular. Believe us, you and your kid(s) are going to enjoy the app. 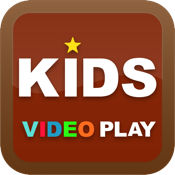 Kids Video Play is a mashup created on YouTube to filter kids dedicated videos, movies and educational clips for fun learning. This app serves as a catalogue of all videos available to watch instantly(of course free of cost). Videos are added on availability basis.